Citation Information: JCI Insight. 2019;4(2):e124232. https://doi.org/10.1172/jci.insight.124232. Multiple sclerosis (MS) and its animal model, experimental autoimmune encephalomyelitis (EAE), are chronic inflammatory demyelinating and neurodegenerative diseases of the CNS. Although neurodegeneration is the major contributor to chronic disability in MS, mechanisms governing the viability of axons and neurons in MS and EAE remain elusive. 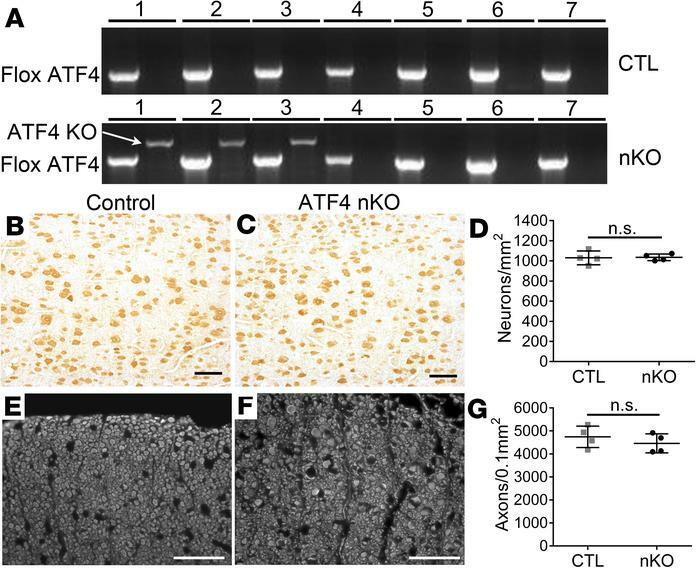 Data indicate that activation of pancreatic endoplasmic reticulum kinase (PERK) influences, positively or negatively, neuron and axon viability in various neurodegenerative diseases through induction of ATF4. In this study, we demonstrate that the PERK pathway was activated in neurons during EAE. We found that neuron-specific PERK inactivation impaired EAE resolution and exacerbated EAE-induced axon degeneration, neuron loss, and demyelination. Surprisingly, neuron-specific ATF4 inactivation did not alter EAE disease course or EAE-induced axon degeneration, neuron loss, and demyelination. These results suggest that PERK activation in neurons protects axons and neurons against inflammation in MS and EAE through ATF4-independent mechanisms. Neuron-specific ATF4 inactivation did not alter the viability of neurons or axons under physiological conditions. (A) PCR analysis using genomic DNA shows that the floxed Atf4 allele was present in all tissues in ATF4-nKO mice (nKO) or control mice (CTL) but the Atf4-KO (KO) allele was only present in the cerebral cortex, cerebellum, and spinal cord of ATF4-nKO mice. Numbering above lanes is as follows: 1, cerebral cortex; 2, cerebellum; 3, spinal cord; 4, optic nerve; 5, sciatic nerve; 6, spleen; 7, lymph node. (B–D) NeuN IHC shows that neuron-specific ATF4 inactivation did not significantly change the number of neurons in layer V of the primary motor cortices of adult mice. (E–G) SMI31 IHC shows that neuron-specific ATF4 inactivation did not significantly change the number of axons in the lumbar spinal cord of adult mice. Scale bars: 50 μm. n = 4 animals. Error bars represent SD. Statistical analyses were done with a 2-tailed t test.